Expansively illustrated, this volume in the "Foundations in Diagnostic Pathology" series encompasses aspiration cytopathology of all major body sites. Experts in the field provide you with a clear, concise, and practical diagnostic approach to the challenges you face every day. Color photomicrographs provide a visual image of individual lesions, to make learning quick and easy. The consistent, convenient format provides quick, at-a-glance reference, making it an excellent resource not only for the pathologists-in-training but for those in practice as well. Uses highly templated chapters to make key information easy to find. Incorporates carefully selected high-quality, full-color images. 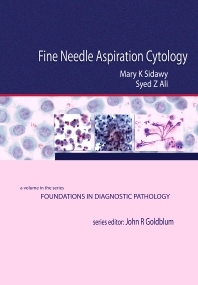 Covers aspiration cytopathology of all major body sites. LIncludes contributions from the world's preeminent cytopathologists.